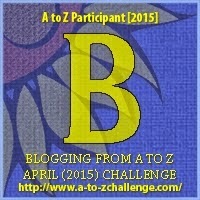 a2z challenge April backstab betray Backstab & Betray! We all live in a competitive and progressive world where people don't have time to talk and spend time with their loved ones. Every participant of this rat race often realized that they would get nothing! Money is not the only thing in this world. Money can buy several things but it can't buy true love, real happiness and memories. Trust me people need to remove the blindfold from their eyes that money is everything! Money will make you dance to its tune but at the end of the day the rat race grows stronger and it increases in length! With more number of participants, its hurting the way of living. Earlier people who used to spend some quality time with their family are now finding it difficult to spend even 5 minutes. Their mind is constantly bombarded with too many stuffs that includes office pressures, performance issues and many more. He wants to be at the top. Everyone would be happy if you reach the apex! But there would be certain sect group that would not be able to digest your success. At one point of time, even if you attain success at a short period of time, these pair of bemused eyes will never stop haunting you. Healthy competition is something that I would appreciate but unhealthy competition doesn't sounds soothing to the ears. I am choosy when it comes to making friends. Not that I am judgmental but I avoid inviting unwanted troubled. My past has been disastrous where I have lost several true friends and I myself have stayed away from backstabbers and betrayers. People should learn to get inspired from table toppers! No one should be jealous of others achievement. Others have reached the zenith only because of their struggles and talent. As I always say, the road to success is full of stones and pebbles. It is a rocky road and you have to go through various kind of struggles to ensure that you cross this rocky road. Trust me it takes a big deal to make good friends. Good friends are like an asset these days. It is hard to find a true friend with whom you could share all your secrets and personal matters. But there are few who pretend to be your best friend but have another face of a python! Beware of such people. They will hurt you and by the time they unveil their true colors you would already be broken and shattered. Would you want to be filled with remorse? I bet no one would ever want to. That's why I always say that don't trust anyone blindly. Dual faced people often have a different motive behind their every actions. And there are few who can't take your success and achievements and talk behind your back. Its obvious that such people can only talk behind you back and that's why some of them stay behind. They should open up and have the guts to say the same thing in front of you. Your absence is something that pleases them because that's when they have ample time to talk about you to someone else. However hard it is but avoid such people from your life Never pay heed to backstabbers. But always be cautious. They only deserve your back. Look ahead and continue walking on the success path. Their curses will backfire on them! Trust yourself and believe in your abilities and capabilities and move ahead in life. Why would you even waste some precious time of your life by paying attention to them! How would you feel when you know that one day your trust is betrayed? Never let this ever happen. Establish a small group! Keep this group to yourself and trust me it is too difficult to identify betrayers and backstabbers. You never know that even your best friend could betray you; you don't need an enemy. Your enemy will hurt you in front of you , but backstabbers in form of people close to you will hurt you behind you and by the time you identify them, you would be disheartened! Stay blessed and have an amazing Thursday! Hey...we did the same word for B...! and yes agree with what you have said! 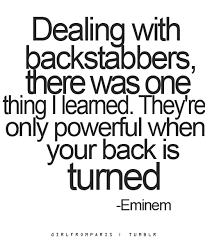 beware of backstabbers!! There are so many backstabbers out there, who are disguised as people close to you! I so hate such people!! Well they cause more troubles than the one who actually cause in front of us! they deserve your back! I've had a fair share of experiences with such people and generally avoid any interaction with them . I've also become an expert at identifying such people. A good friend and wise man (one of the few people I've known and trusted for nearly a lifetime) once told me the same thing, but in different words. He also said that we are lucky if at the end our lifetime we can count our true friends on one hand. There are and will be so many impostors. I just read another blog and the writer talked about the same issue and had a great quote about friends betraying her. I can't remember the exact words ,but something like this. "If you can't keep your own secret ... don't expect anyone else to keep it." I hope I didn't just do damage to her words. I tried to remember it. The older I get, the less I trust and that actually makes me sad. I am also better at recognizing devious people and people who have an agenda. It is known to many and people often advice me to stay away from such folks! They are harmful. Great post! I agree with much of what you had to say. Trust is hard to gain in this day and age. If you like Science Fiction, I am doing a story over at WordPress for the A-Z Challenge.. would love to see you there. Yes I do like Science Fiction. Will surely read your work, Ravyne! There are so many things that you've mentioned that one could learn.. about oneself, true friends, success, backstabber..
Great Post! Very thought-provoking for me today! So far today, I've read about bitterness, betrayal and backstabbing. Why are there so many negative words starting with 'B'? It is usually not possible to identify a backstabber in your close circles before you get stabbed. I might trust a known enemy someday, but I would never trust a backstabber again. Identifying a backstabber is the most difficult thing to do. Trust me , watching your trust getting betrayed is disheartening.. The words in that imagery said by Eminem are so damn true! Identifying backstabbers is truly the most difficult job in a world like this! Good friends are like an asset these days. I second you! Thanks Aaysh! Stay away from such people!